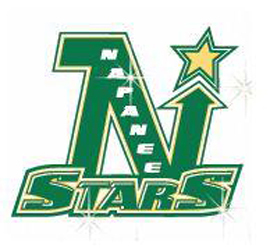 The Napanee Midget BB Stars earned Silver medals in the 12 team Regional Silver Stick in Midland. In the final, facing Ajax, an A Division team, they fell 5-3. The locals led 3-1 early on, but could not sustain it. Murray Craig came from sick bay to tend goal. The Stars reached the finals after shutting out Collingwood 3-0 in the semi-finals. The locals were solid in the round robin with identical 3-1 wins over Stratford and Innisfil and a 2-2 tie with the King Rebellion. -The Napanee Joyce’s Meats & Deli Atom BB Stars put in another great performance to win silver medals at the six team Northumberland Silver Stick in Cobourg. They faced Tillsonburg in the final game, but were edged 2-1 in a close fought match. Wyatt Albright got the lone goal for the Stars. In the semi-finals, first-placed Napanee defeated Northumberland 4-2. Goalie Jack Godfrey got the win. In round robin play, they defeated Newmarket 5-2, Cumberland 3-1, and the eventual winners, Tillsonburg, 3-2. Kohen Cutler scored all three goals against Tillsonburg to lead the Stars to victory in that one. -The Napanee Exit Realty Acceleration Bantam BBs travelled to Ottawa for the Capital Mid Season Showdown Tournament. A win, tie, and loss put them into the semifinals facing Stittsville, a team they had defeated Napanee 4-1 in the round robin. Their opponents got the only goal in a tight, defensive game that saw the locals eliminated. Earlier, they had defeated Nepean 2-1, with a goal and assist each to Zach Slaven and Quintan Pierce. Marshall Maracle got the lone goal in a 1-1 tilt with the Ottawa Sting. -The Peewee AE played in the Huron Regional Silver Stick in Hensall, north of London. They were edged 4-3 by the eventual tournament winners, Mt. Brydges, before losing to Lambeth 7-1 and Wallaceburg 6-1. -In league play, the L & A Mutual Insurance Atom AEs lost 7-2 in Gananoque, and 15-0 facing Frontenac at home. -The Peewee BBs, in a home-and-home with Tweed, shut out their hosts 6-0 on Saturday and won 8-1 at the SPC on Sunday. Nic Lamarche scored a natural hat trick, while Caleb South had two, and Carter Vermilyea, Nick Campeau and Zared Holler had singles. -The Novice BBs added another game to the win column with a solid 3-1 win in Wellington over the home team Prince Edward County Kings.